If you have created a multilingual book, you must be able to select the language. In order to have a great deal of flexibility here too, the language code, ie the two letters of the country code, is displayed by default. So you do not have to set anything and still has the language switching available. As you can see, this is a bilingual book with EN and DE as languages! There are no language icons defined yet, the language code would be displayed. The language can then be changed in the book as well as via special language icons. But you can also use icons instead of the two letters. This can be graphically designed letters for the country code or even flags! To set icons, click on the Button and a similar window as for the definition of social buttons opens. Here, icons have been assigned for the English language code, with the German language code the characters “DE” are displayed. 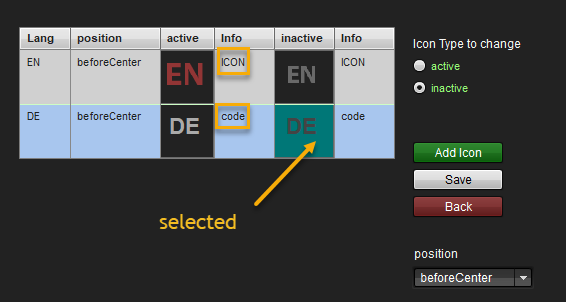 The language code for the non-selected (inactive) DE language is selected and can be replaced by an icon by clicking on the@Add icon@button. This icon (e.g., a flag icon) is selected via the file explorer and then loaded. Going back to the basic window, it will be shown that icons are set for the two languages ​and that three social buttons have been defined. The window can be closed with Close; all settings are saved.